Dozens of "witches" executed in a Scottish town more than 200 years ago are to be pardoned to mark Halloween. Prestonpans, in East Lothian, will grant the pardons under ancient feudal powers which are about to disappear. Descendants and namesakes of the 81 people executed are expected to attend Sunday's ceremony. More than 3,500 Scots, mainly women, were executed during the Reformation, for crimes such as owning a black cat and brewing up home-made remedies. The atmosphere of paranoia and suspicion reached its peak under the rule of King James VI - later King James I of England. On Sunday evening, 81 pardons, secured in the Prestoungrange Baronial Court on 27 July this year, will be publicly declared and a wreath laid at a specially-commissioned plaque. Local historian Roy Pugh, who helped secure the pardons by presenting evidence to the court, will make the declaration in what he described as a "simple and solemn" ceremony. He said: "It will recognise the crimes that were perpetrated against these people. "It's too late to apologise but it's a sort of symbolic recognition that these people were put to death for hysterical ignorance and paranoia." Dr Gordon Prestoungrange, the 14th Baron, decided to convene his court to consider the pardon before it was abolished on 28 November under legislation passed by MSPs in 2000 to end Scotland's feudal system. The court also ruled that there should be an annual ceremony, including re-enactments of the "tragic events", in the town. 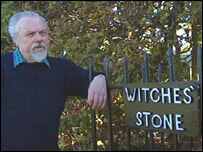 Mr Pugh's book, The Deil's Ain, caused controversy in 2001 for its strong criticism of the role played by the Church of Scotland in persecuting supposed witches. He said many of the accused were tried without defence lawyers by "kangaroo courts" - chaired by local lairds with no legal training and assisted by the Kirk. Adele Conn, the Montjoye of the court - the ancient equivalent of a marketing manager - said the pardons were for the convictions under the Witchcraft Act 1735, although only the monarch could pardon them of treason. She said: "A lot of local people are intrigued by what we are doing, so we hope to get a good turnout on Sunday. "There were some concerns that we've got the ceremony on Halloween but we couldn't have a witches remembrance in the middle of March. "People associate Halloween with witches and the ceremony will not be flippant. "It has a serious purpose, we're respecting these unfortunate individuals." 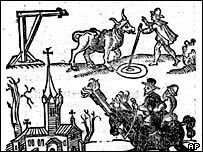 One of the area's most notorious episodes was the North Berwick witch-hunt in which Agnes Sampson confessed under torture to leading a coven responsible for a storm allegedly intended to sink King James VI's ship as he returned from Denmark with his fiancée, Anne.